Earlier this month the London-based Frontline Club for journalists set up a register that engages freelance journalists – mostly those who work in high-risk and conflict zones – for a chance to organize. 1 The profession of journalism is becoming increasingly dangerous. 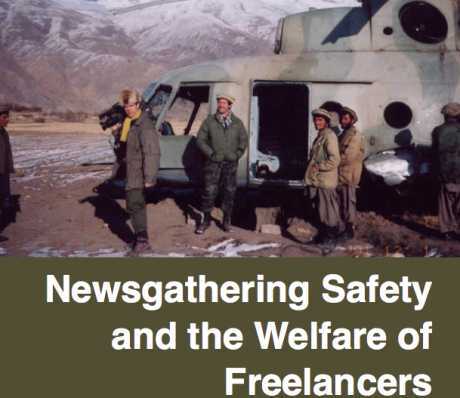 2 The industry has become increasingly dependent on freelancers to provide foreign news coverage. 3 In many cases those journalists who are taking the greatest risks are also those who are least supported when things go wrong in the field. Founder of the Frontline Club Vaughn Smith went on to announce the publication of the News Safety White Paper (PDF). The white paper recommends how the news industry can more effectively incorporate freelancers into the industry and how freelancers can better organize themselves to meet new media industry needs. More than 20 years ago, I was an accredited CBS News radio stringer with several years of experience covering the guerrilla war and related events in El Salvador. In 1991, now from CBS’ office in the Sheraton Hotel in Damascus, I called CBS headquarters in New York and told my radio producers that I was planning on going with Kurdish rebels into northern Iraq during the post-Gulf War uprisings against Saddam Hussein. In other words, CBS News wanted me to take their camera into the war zone at my own risk without either any insurance, or any guarantee of compensation, with the agreement that CBS News would have the right to be the first news outlet to review any footage I might gather. Then, if they wanted to use it, we could negotiate a price. More than a month later–after I had spent more than two weeks in prison–CBS News ran several pieces of combat and related footage that I sent from Iraq, and we negotiated, post-publication, a fee of US$12,000. I gave half of it to the mother of my close colleague, Gad Gross who was killed in Kirkuk. If you’re a freelancer, getting involved in the Frontline Freelance Register is relatively straightforward. You must apply and commit to a code of ethics and commit to completing first-aid and hostile environment safety courses. Membership is open to all those who commit to the code of ethics, according to the FFR. Leaders of the Frontline Freelance Register have a launch event planned in New York later this month.